When you make the whipped cream, both for the tiramisu cream and the topping, make sure you chill the bowl and the beaters for at least 5 minutes in the freezer for better results. When you are separating the egg yolks, know that they separate more easily when cold but make sure they are warmed to room temperature before starting the recipe. It usually takes a 1/2 hour to warm them up. When getting the ladyfingers ready for dipping in the chilled espresso, have them already separated in sets of 2 ladyfingers which makes the process go fast. You can use a mason jar funnel to help keep the top edges of the mason jars clean. If you have a steady hand for filling the mason jars, you should be fine. The espresso does make a real difference in flavor but in the event that you can not find espresso, I have substituted a dark roast coffee, for example, French roast. This dessert is all about planning, I suggest making the espresso ahead of time, I have made it the night before, it just helps to have things ready for assembling everything and then you can focus on making the tiramisu cream. 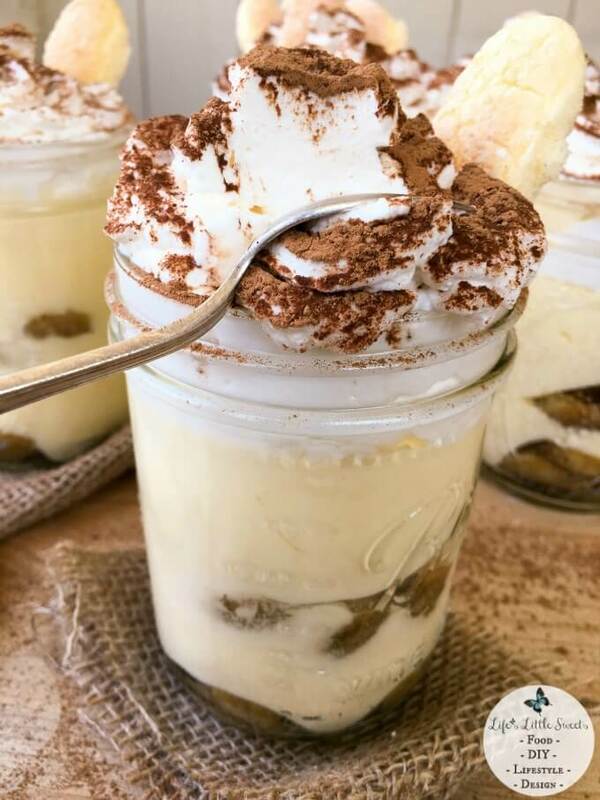 Make sure that the tiramisu is chilled at least 4 hours before serving, I highly suggest chilling in the refrigerator overnight, it does wonders for firming up the cream and setting the entire trifle but do not wait longer than 2 days because it might start to separate. One of these jars is enough to share, definitely enough to indulge yourself and very easy to save for later or take along. 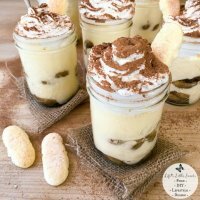 I hope you enjoy Mason Jar Tiramisu Trifle as much as my family does, this is truly a special dessert! 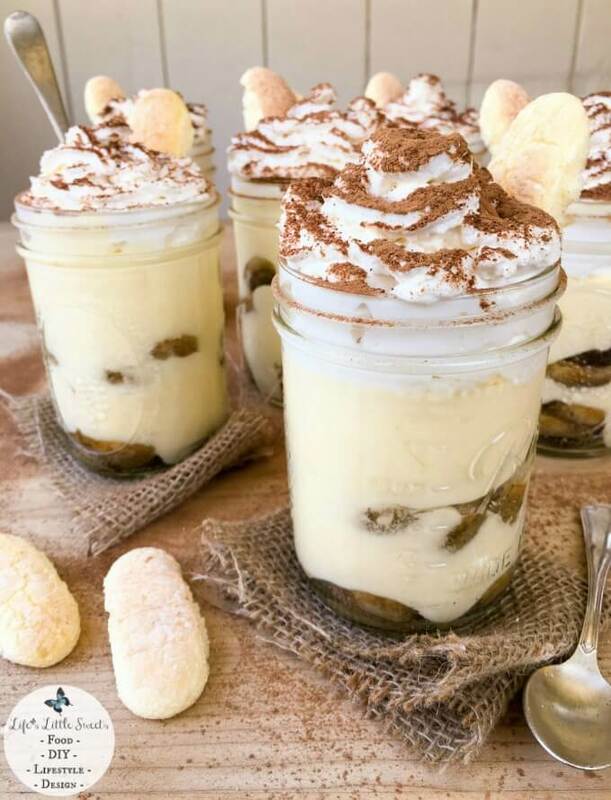 This Mason Jar Tiramisu Trifle is a new take the classic tiramisu dessert. 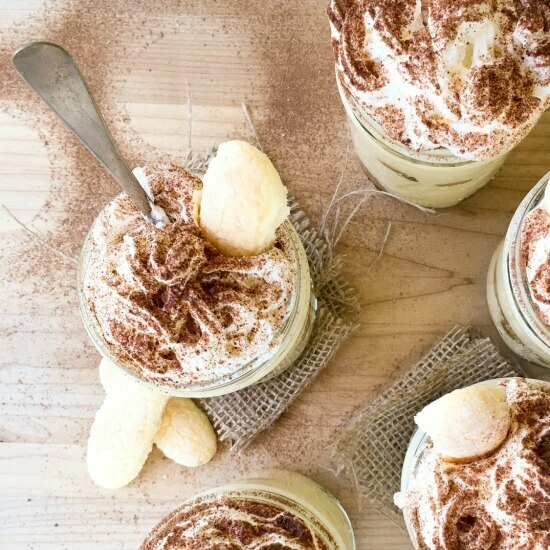 There is plenty to go around as this recipe makes 6 pint-sized mason jars filled with delicious tiramisu dessert, yet only requires 9 ingredients. With 2 layers of delicious, espresso-soaked ladyfingers, rich tiramisu cream and lofty whipped cream dusted with cocoa, Mason Jar Tiramisu Trifle is going to be your new most-requested family favorite! Add the Mascarpone cheese and beat until combined. Retrieve the tiramisu cream from the refrigerator, and using a 1/2 cup measure, scoop out the cream and put it on top of the espresso soaked ladyfingers for all 6 jars, there is no need to push it down because it will settle later but gently smoothing it out is okay. Do you love tiramisu too? What is your favorite way to enjoy tiramisu? Please share in the comments below, Thank You! Thank you for the shout out Sara! I’m happy to see my Tiramisu recipe put to such a delicious use! Thank you Chef Dennis, thank you for being so supportive, especially when I e-mailed you about a year ago when I was developing this particular tiramisu mixture. I love your recipes by the way! WOW- all your blogs are pretty and informative, but this one is extremely beautiful, and one of my favorites! Hey There Mary! I am so glad you like them! Mason jars are so useful in so many ways, I just love the utilitarian look of them too. Let me know how it goes, if you try it, it’s really a yummy recipe, one of my all time favorites! 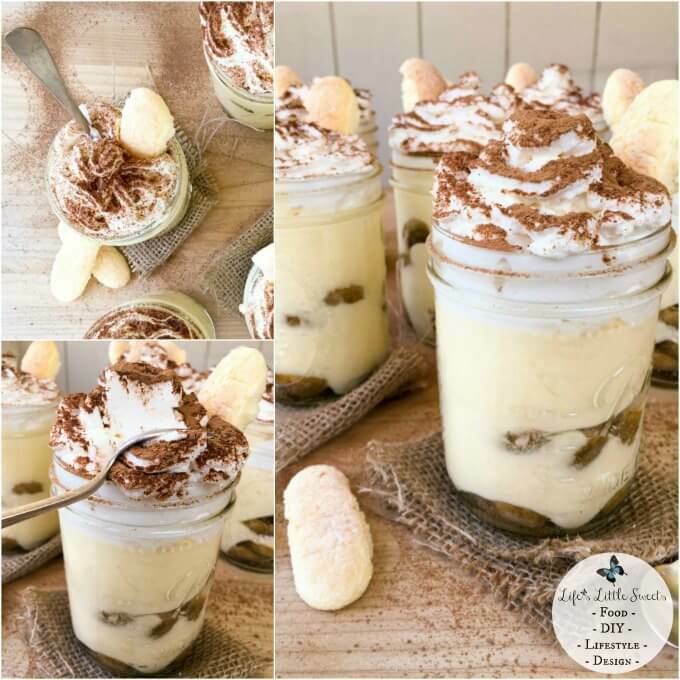 Great flavors and a really fun way to serve this tiramisu. Thank you Peter, I am so glad you like it! Great pictures and your instructions are thorough! my husband has been nagging me for tiramisu and here we go. The perfect recipe! Have you ever made your own marscapone? If so could you share the recipe. I live in China and marscapone here is about $12 for a small container!! 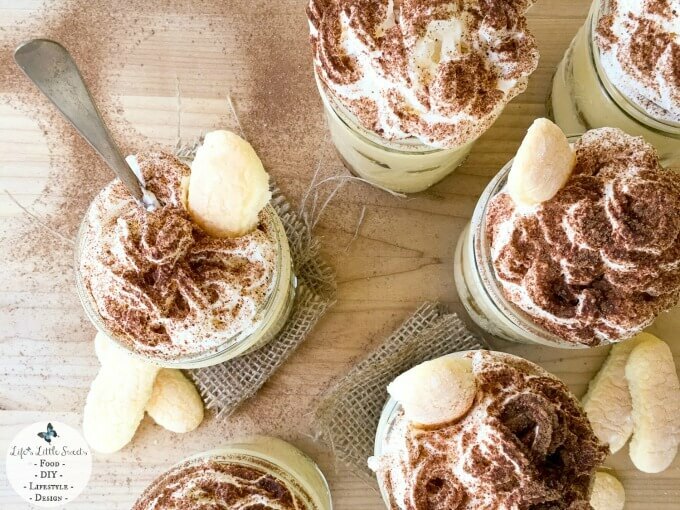 I’m really not a dessert person but do lurve coffee and if I am gonne go dessert it is usually a tiramisu, the sounds delightful… Great pictures as well! Yes, tiramisu is the ultimate dessert! Thanks for stopping by! Thank you for sharing this recipe. I think Jacky will love it! I love you play on words there! Hilarious 🙂 thank you for stopping by and commenting! Wow, these look incredibly good! I’m always looking for excuses to put my hoards of mason jars to good use! It’s very annoying to see a 5 star recipe, but clearly now of the raters have made it. I’ve read the recipe five times and no where does it state where the mascapone goes?!?? It came out perfect and looked beautiful. The only thing I might change next time is add a little rum or Kahlua to the espresso. Also change the cookie for the garnish. I don’t really like the taste of the lady fingers on their own. Maybe use a biscotti. Anyway, a fabulous recipe. Thank you!!!! I made these for Christmas Eve and they were delicious and gorgeous! I did add Kahlua to the espresso. The only thing I would change next time is I would make more of the tiramisu cream and put less whip cream on top. I found cute ribbon that looked like Santa’s coat that looked perfect around the jars. Thank you for an amazing recipe that I will use again and again! I’m so glad that you like the recipe! It’s a classic recipe and everyone always loves it! Happy holidays! Thank you for reporting back!